When you walk down the lane you see the cottage, crouched small and white-washed against its neighbour. The sea-polished stones mark the boundary of the garden – a small patch of green scattered with daisies and sheep droppings. 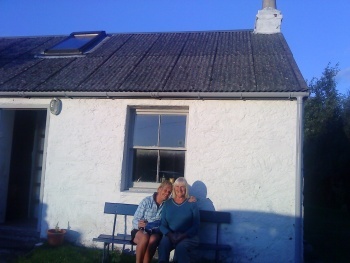 The front of the cottage: my mum and auntie Marilyn enjoy an early evening drink. The door is blue, the paint peeling and cracked. As you enter the small porch, there’s a familiar collection of old coats hanging on the hooks to the right. A wooden ladder leads to the loft upstairs, where old mattresses are scattered across the bare wood floor. We used to sleep up here as children, listening through the open boards to the crackling of the fire below and the low murmur of adults talking late into the night. The smell of woodsmoke hits you when you walk into the front room. Damp hangs heavy in the air too. The last person to stay will have laid a fire ready to light in the hearth. A few balls of newspaper, twisted twigs from the beach and some lumps of coal. You wind up the old wooden clock on the mantelpiece and the solid tick tock fills the silence. Through in the bedroom, it’s cold. There’s no heating in here. But in the summer the evening glows through the window, bathing the room in orange. When it was a fisherman’s cottage this room was kept for best, reserved for visiting clergy and funerals. There’s a small kitchen out the back, the cupboards bursting with mismatched crockery collected over the years. In the larder ancient tins of food gather dust – beans, spaghetti hoops and ravioli left over from holidays long since past. The view from the square kitchen window takes your breath away – out over the fields and the sea to the Kintyre Peninsula beyond. The secret coves and beaches beckon you to come visit by boat.